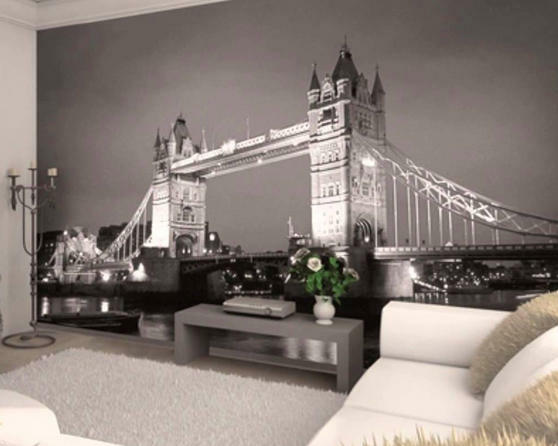 Transform any room with a stunning wallpaper mural of the Tower Bridge. Just paste the wallpaper mural and hang it the same as standard wallpaper, no need to overlap and trim like others and a small number of panels make them much easier to hang transforming your wall. One flat standard shipping rate of ?3.99 per order to UK Mainland. Add additional items and pay no extra shipping charges. Why not try our Express "Get it Fast" Service for ?9.99 per shipment to UK mainland addresses? Guaranteed next day delivery subject to your order arriving by 12 noon on Monday-Thursday. All items are quality checked, hand packed to order and sent using a registered courier service. Should you wish to return the item, this can be administered by contacting us at sales@beddingdirectuk.com. We will then by return issue you with a returns number that needs to be affixed to the parcel and the necessary instructions to organise an item pickup. Items need to be returned in perfect, unused condition via a recorded, insured mail or a courier at the buyer's own cost. Once the item has been received and inspected by our Returns team, a refund of the selling price will be administered. The process will take no longer than 2 working days upon receipt of the returned item. We do not charge a restocking fee. Should your item arrive faulty or damaged, Bedding Direct UK need to be notified within 5 working days of receipt of your goods. Upon notification your goods will be picked up by our courier at a time convenient to you, inspected and replacement items sent or a full refund administered. We guarantee to keep you informed throughout every step of the process. Copyright © 2014 Bedding Direct UK, All rights reserved.